I’m having lots of warm, fuzzy feelings while finally reading a book I picked up by chance last summer. 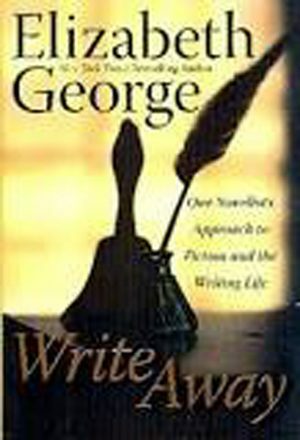 The book is Write Away: One Novelist’s Approach to Fiction and the Writing Life, by Elizabeth George, author of more than a dozen great mystery novels. Part of the reason I’m enjoying it is that I can now cross “Write book on how to write fiction” off my to do list. While no two authors write the same way, she’s pretty well nailed how I write—or at least how I try to write. Not seat-of-the-pants-hope-it-works-will-have-to-do-lots-of-writing-if-it-doesn’t (although I just tried that for a short chapter book, and am not looking forward to the rewriting) but plan-and-think-and-know-your-characters-and have-everything-come-out-of who-they-are-and-craft-every-aspect-of-it. Every new page has me saying, “Yes!”— sometimes silently to myself and sometimes out loud in the hope someone somewhere is sharing my delight. So nice to discover someone who knows a lot about the subject is totally in agreement with you. But the main reason I’m feeling warm and fuzzy is that every page I read is making me anxious-crazy-driven to start writing—really writing. To apply the craft I both understand and love. I didn’t always realize it but I’ve wanted to be a full-time writer all my life—and I know that if it’s ever to be, it has to be now. And this book is acting like tinder, starting a fire blazing in my heart—a fire I have no intention of putting out, as i have so often in the past, because there were more important things to do. This time, I’m going to feed the flames, and allow myself to forget about everything else and concentrate on me—my writing and my dreams. Not easy, but it’s time. Past time. Your readers are waiting! Happy writing. I must add this book to my wish list.